• Design China Majesty Steel Structural Design Co., Ltd.
Main Contractor Shanghai Xian Dai Architecture Design (Group) Co., Ltd.
• Façade Zhejiang Zhongnan Curtain Wall Co., Ltd. The Sheraton Moon Tai Lake Resort hotel is located next to Nan Tai Lake in Huzhou, a city situated west of Shanghai and north of Hangzhou, with views to Suzhou and Wuxi across the lake. Since ancient times, Huzhou has been known as “the house of silk” and “the land of plenty," and is the only ancient cultural city in the Nan Tai Lake region. The hotel connects with this local context, referencing both traditional and modern conditions, and is iconic in its integration and reflective dialogue with the waterscape of Tai Lake. The Moon Hotel takes full advantage of its waterfront by directly integrating architecture and nature. The circular building corresponds with its reflection in the water, creating a surreal image and mutable connection between solid reality and an aquatic phantom. Beneath the sunlight and the reflection of the lake, the curved shape of the building is crystal clear. When night falls, the entire building is brightly illuminated by both its interior and exterior lighting. Soft light wraps around the hotel and the water, resembling the bright moon rising above the lake, blending classical China and modern China in an interlocking embrace. 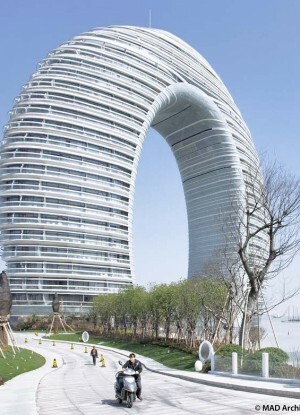 From the beginning, designing an inhabitable vertical glass ring posed a great challenge for the structural engineers. It was eventually decided that a reinforced concrete-core tube would be most lightweight, most capable of containing a dense program, and most earthquake-resistant. However, it was also a challenge to implement a concrete structure and meet the goal of reducing environmental pollution during construction. The mesh-covered, curved surface structure gives the building its necessary rigidity, which is further enhanced by the bridge-like bracing steel structure that connects with the double-cone structure at the top floor. The hotel façade is covered with layers of fine-textured white aluminum rings and glass, creating a sense of drama and ambiguity around the building's scale. The thin shape of the structure allows for maximal ventilation to the various rooms and suites. Each floor also has open-air terraces, shielding the interior from direct sunlight during the summer, while allowing for sunlight to penetrate the interior during winter. It is common to see people enjoying the sunlit warmth from their balconies during the summer. The outdoor space at the top of the structure acts to supplant the footprint at the ground by providing a roof garden for the enjoyment of guests. The annular shape of the hotel provides all rooms with favorable views of the waterfront and surrounding city, while allowing for maximal natural light in all directions. The arc-like public space at the top of the building has great open views and acts as a “mid-air” multi-purpose room for large-scale activities. The experience of being at the top invokes a feeling of floating over the lake. Through all of these gestures, the Moon Hotel emphasizes the harmony between man and nature, and enhances visitors' sensual and spiritual experiences. 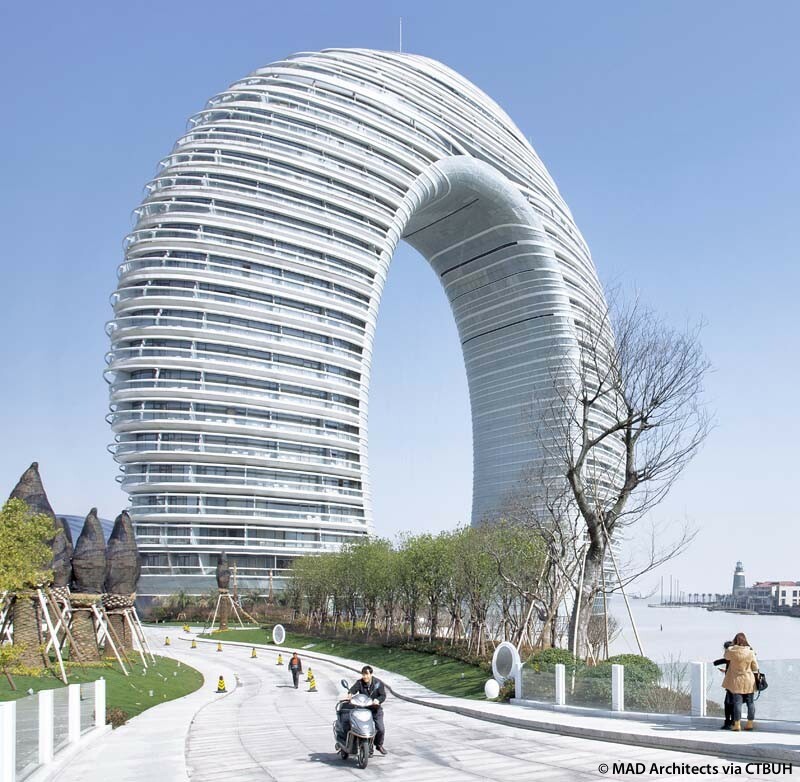 It stands as Huzhou's new symbol of the connection between humanity and nature, past, present and future.